The Colorado River drains a huge area of the arid southwestern United States. 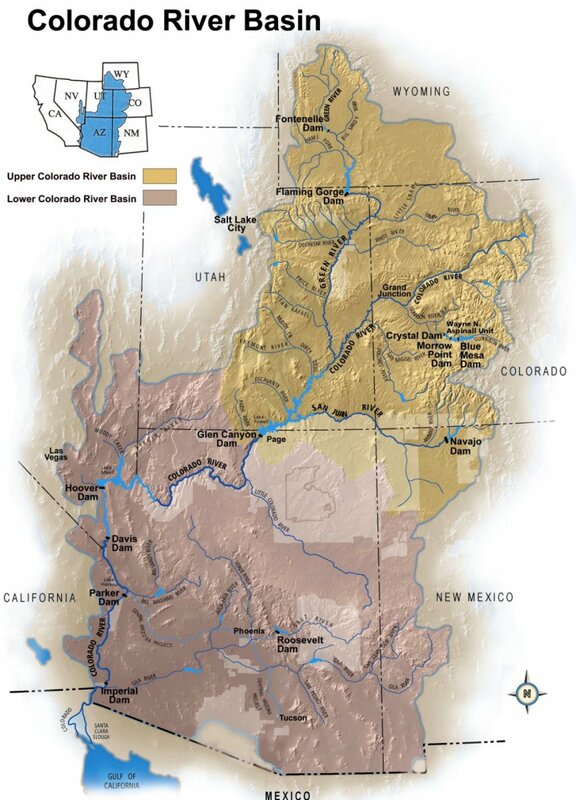 While the source of much of its water is from the high forests on the western side of the Rocky Mountains, the main river flows through desolate canyons and dry desert areas. By building dams across the river, we have been able to hold back some of the water that would otherwise flow downstream. The result of each dam is a reservoir of "saved" water that can be tapped as it is needed. The mighty river that carved the Grand Canyon is now responsible for providing water for growing numbers of people and agriculture across the southwest. Click the map image, left, for a larger view. 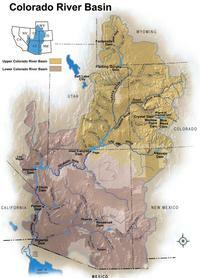 Examine the map to get familiar with the location and setting of the Colorado River Watershed. Focus in on the locations of the large reservoirs formed by Glen Canyon Dam (Lake Powell) and Hoover Dam (Lake Mead). Click to enlarge the image on the right, which shows a portion of Lake Mead in March of 2014, a time when the reservoir was filled to just 42 percent of its capacity. The whitened canyon walls or "bathtub ring" above the water indicates the reservoir's highest level. The white bathtub ring is higher than a 10-story building. 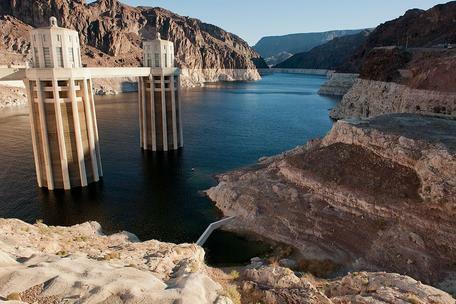 Watch the video below and consider the reasons discussed that are responsible for the water deficit and make note of the levels of Lake Mead that the video refers to. Note: the lake levels are referred to in meters instead of feet in the video. Read the article Climate models help stakeholders from Climate.gov, and refer to the graphs below of water elevation (a measure of how full reservoirs are) at Lake Mead and Lake Powell over time. 1. 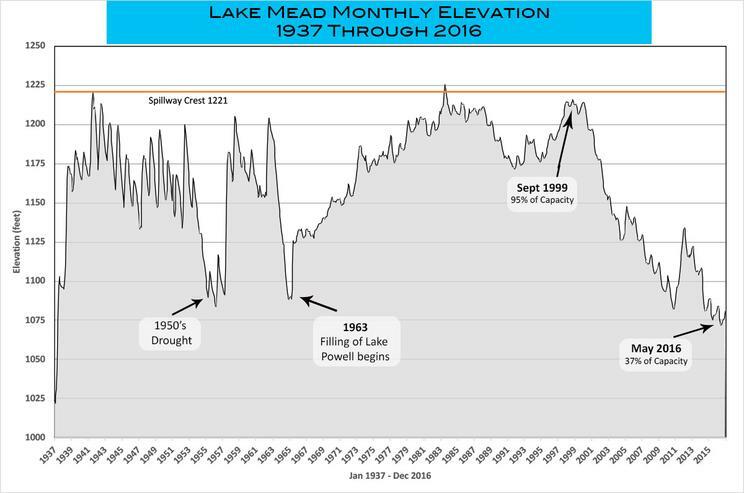 Consider what the "squiggly lines" on the graphs really mean... Use the graph of Lake Mead levels to describe a brief history of the reservoir. Tell when and how the reservoir got started, how long it took to fill, and mention events that affected its level. 2. When Lake Powell began filling in 1963, water was diverted from Lake Mead, causing its level to drop. Beginning in 1964, how long did it take to capture enough water to fill both of the large reservoirs? 3. 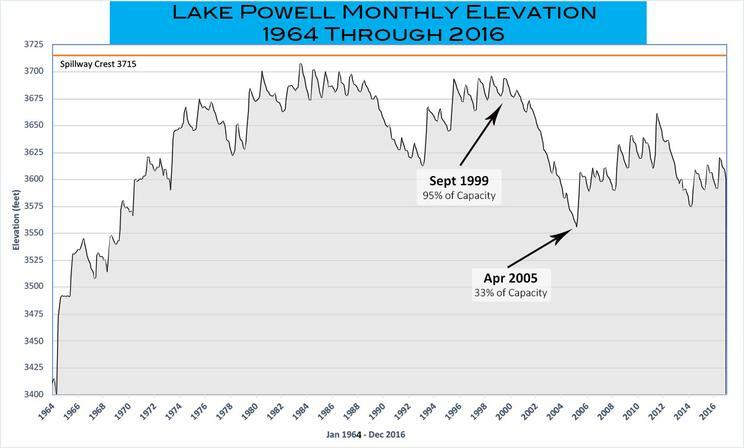 The levels of Lake Powell and Lake Mead both show steep declines since after 1999. What are the things that control the level of a reservoir? 6B: What's Responsible for Lower Reservoir Levels? 6C: Can the River Continue to Meet Demand for Water?